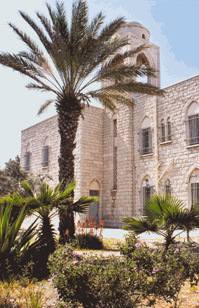 The community of Our Lady of Mount Carmel was founded in 1892 by a group of French Carmelite nuns. Today the community of about twenty sisters is made up of women who come from ten different countries and four different continents, even though the common language is French. The face of the present community is in continuous change. Most of the sisters come from other Carmels in their respective countries. Initially they come out to help; some stay on definitely, others after a few years of enriching community life, prefer to return to their original monastery. Founded during the pontificate of Leon XIII, the Great Pope of 'modern times', who in some ways resembles John Paul II, the Monastery carries in its prayer the special intention entrusted to us by the Pontiff: “Union of hearts, unity of the Church, prayer for the Jewish people”. A mission which today has not lost any of its urgency! Some of our friends have suggested that our special intention carried in prayer by the Carmelites for over a century is not a stranger to the atmosphere of tolerance and friendship so particular of the city of Haifa. Why the name “La Beauté du Carmel” (“The Beauty of Carmel”) for our site and our online shop? There is a spiritual meaning to this. It is an expression of biblical origin – the prophets Isaiah and Jeremiah use it. It was used again by the Fathers of the Church – Gregory of Nisse used it for what would later be the deep vocation of our Order: “The beauty of Carmel will be given to the soul which will resemble a desert” And finally, it is through this name “Beauty of Carmel that the Carmelite Order originally refers to the Virgin Mary, our Mother and Patroness, to whom our monastery is particularly devoted. Why the site of the Carmelites of Mount Carmel? We are conscious of being carriers of a special grace, which does not come from ourselves, but from the actual place where we live, Mount Carmel. Now that pilgrimages to the Holy Land have picked up again in big numbers, very often groups come to celebrate Mass in our chapel. We are amazed at the great emotion pilgrims feel in being able to pray with us here as they officially commence their pilgrimage. On our website we offer those who cannot come to visit us, a small glimpse of our monastery, of our life… and soon we hope, of our country in a special webpage we are preparing. We also offer the possibility of purchasing some small souvenirs of the Holy Land, generally well appreciated, which are products of our own handcraft or that of artisans from Bethlehem. In fact we are always concerned about the Palestinian Christians who live in a very difficult humanitarian and economic situation and so hope to somehow help them. N.B.- You will find additional information by clicking on this link.